University President Michael Drake spoke Wednesday afternoon on the importance of human connection in overcoming community challenges. 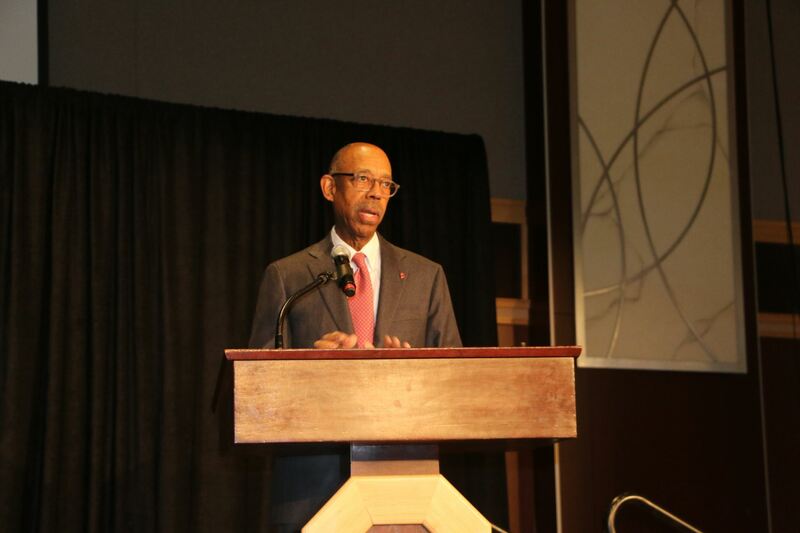 The 11-minute speech took place during lunch in the Archie M. Griffin Grand Ballroom at the Ohio Union during the university’s first-ever Community Engagement Conference. It touched on two high-profile problems in Ohio — food inaccessibility and opioid addiction — and the need for people to work together to solve them. “These are places where we need partners and need to partner with people to be able to find the most effective solutions,” Drake said. The university’s role as a central part of community work is essential, he said. Drake spent several minutes describing the President’s Prize program, an annual award founded in 2016 given to two graduating seniors each year to launch community outreach programs. Prize winners are given a one-year living stipend of $50,000 as well as $50,000 in startup funds for their programs. Ohio State has awarded the prize to four students so far. Drake highlighted two of them in his speech: Maggie Griffin for her project to increase fresh food accessibility in Ohio, and Alina Sharafutdinova for her impending project in a Franklin County high school to offer assistance to students impacted by the opioid crisis. While the President’s Prize program allows students to propose projects anywhere in the world, Drake said he was proud to see winning proposals that focus on Ohio. “It’s been great to see that the best projects that we’ve seen have routinely focused on our own communities, right here with the people that we live and work with, on things that are the most pressing problems that we face,” he said. Speaking at an event designed to highlight the importance of working together to solve problems, Drake used the example of the two President’s Prize programs to re-emphasize the importance of partnerships.